48 y.o. 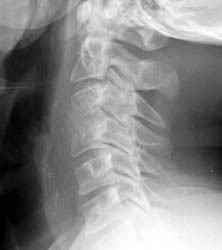 male with a history of alcohol abuse, depression and degenerative joint disease who is complaining of severe pain in his right neck and shoulder radiating down to his right third and fourth digit. The patient underwent anterior cervical disc fusion. Four months after the initial surgery, the patient still had pain but this time numbness was on flexion mainly and localized to the C5 region. Lateral flexion and extension radiographs taken 6 months after surgery demonstrate incomplete graft incorporation (delayed healing). 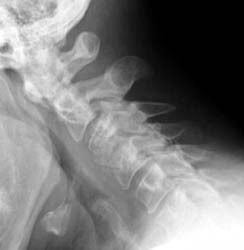 Furthermore, with flexion there is anterolisthesis of C4 on C5 (one level below the fusion) by 2-3 mm.